Slotland now accepts Bitcoins for instant deposits and next-day withdrawals. Deposits made in Bitcoins, the world’s most popular cryptocurrency, are credited instantly and withdrawals are processed the next business day. A variety of Bitcoin bonuses are available until this Sunday. During its 19th birthday celebrations this month, Slotland has also added a new game and continues to offer a variety of weekly birthday bonuses. 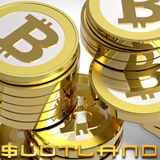 Slotland converts Bitcoin deposits to USD and automatically adds them to players’ cash balances. Bitcoins are quickest and easiest option for casino deposits and withdrawals. Bitcoin bonuses with a variety of wagering requirements are available until October 22, 2017. Introductory Bitcoin bonuses are available for deposits made by Bitcoin until October 22, 2017 only. May be redeemed twice; wagering requirement 23X. May be redeemed twice per day; wagering requirement 14X. May be redeemed twice a day; wagering requirement 10X. With this month’s debut of the new Chinatown slot, Slotland now offers 60 unique games. Chinatown is a 21 pay line real-money video slot with an expanding Wild symbol and chances to win up to 15 free spins. Mouth-watering Chinese noodles, exquisite Lotus blossoms and antique Ming vases spin on Chinatown’s reels. The Sword of an ancient Chinese warrior is Chinatown’s Expanding Wild symbol. It can appear on any reel and when it does it covers the entire reel. Slotland’s 19th birthday celebrations continue until the end of the month. 23X wagering requirement; valid for slots, keno & progressives. 13X wagering requirement; can be redeemed three times a day; valid for all games. A new game, some of its best casino bonus offers ever, and now the addition of Bitcoins -- what a party, Slotland! Happy 19th birthday!! !